The cutworm successfully fought off the ground beetle by a lot squirming and biting. The sun was very bright and was taking its toll on the beetle — he eventually gave up. The cutworm crawled away as fast as it could to find shelter. My idea was to pick up the worm and toss it to the chickens as a snack. But just before the cutworm ducked under some leave litter, a tiny insect — not much more than one-sixteenth of an inch long — flew in out of nowhere. In a split second, it lightly landed on the cutworm then just as quickly flew away. 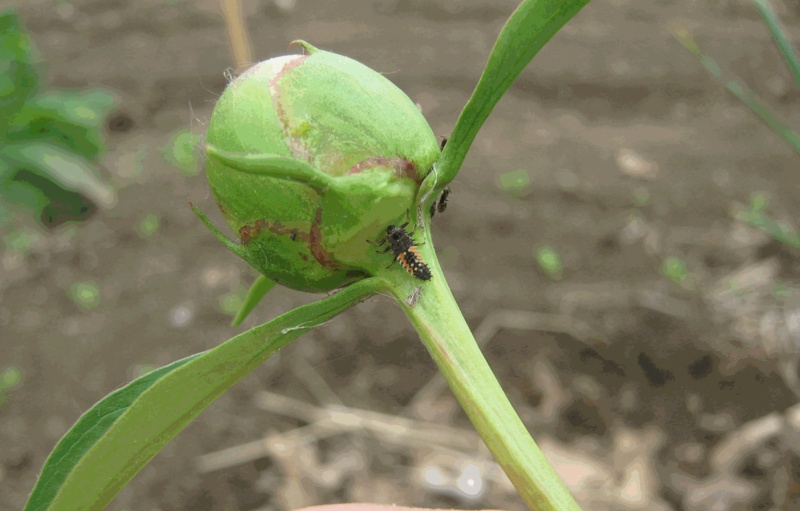 Ladybug larva on peony bud looking for aphids to eat.